In a time long ago, there were a couple of very large data breaches. You may remember them: Target and Home Depot. Way back then, in 2015, the payment cards customers used at point-of-sale (POS) systems at these places and everywhere else in the United States required swiping a card, so the machine could read the magnetic strip on the back. Well, as is now well known, it’s not so hard for cyberthieves to recreate cards and use them to make their own purchases when they can get all the needed data from hacking into a location and just taking it. 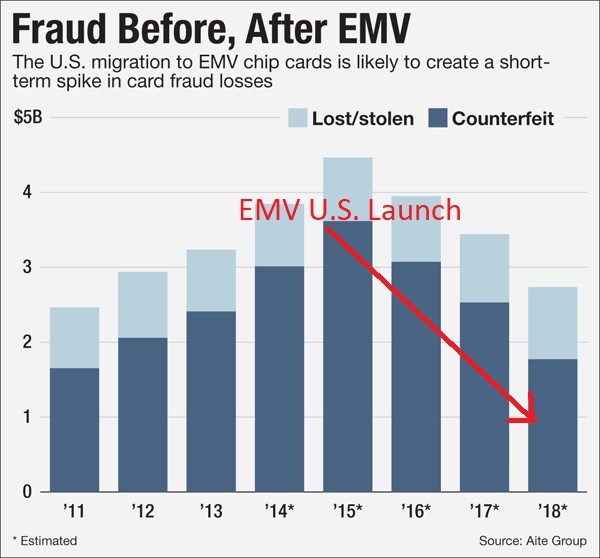 After those biggies, the U.S. government started pressuring card issuers to provide EMV (Europay, MasterCard, Visa) chip cards to consumers for added protection. While the adoption rate was initially slow, according to statistics from Visa, EMV adoption is up to 2.7 million stores as of December 2017 and accounts for 59% of all U.S. storefronts. That’s an increase from 392,000 stores in September of 2015. An even bigger benefit is that it has reduced payment card fraud by a whopping 70% in a little over two years. The number of EMV cards in use increased in the same timeframe from 159 million to over 481 million. But while the EMV cards are more secure they are not 100% safe. The FBI warned users in 2015 that while it’s more difficult for these to be counterfeited, the risk of card-not-present (CNP) fraud is more prevalent. This refers to situations where the details from the cards are stolen and used to make purchases online. All the fraudster needs are the name, expiration date, and the verification code to do this. Security firms are warning that malware can make it onto systems that run the online stores where it can steal payment card information when it’s entered into the payment pages on websites. In addition to this risk, a different type of fraud is now being seen called account takeover (ATO) attacks. 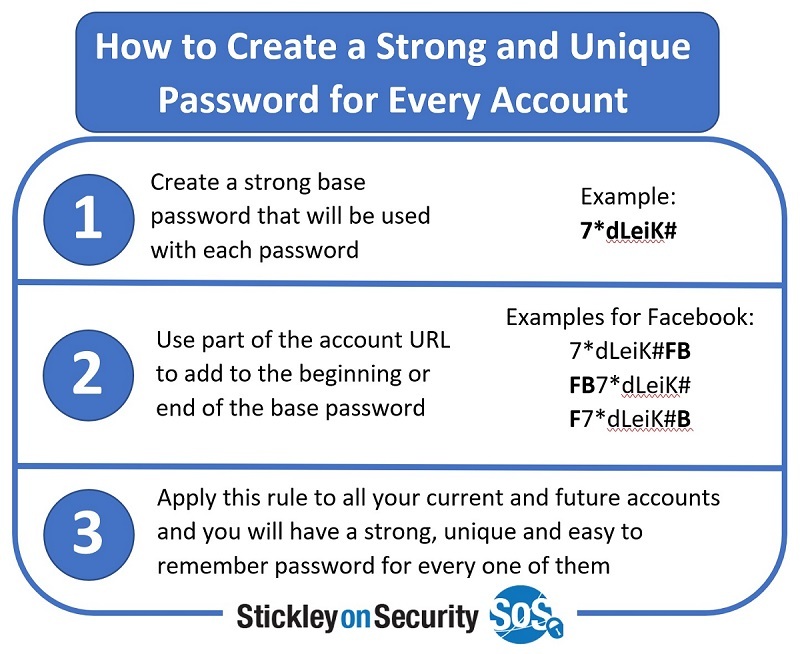 The cybercriminals are using passwords they gain in other ways to get access to online accounts and go shopping. Password reuse is no laughing matter. The criminals will use login names and password combinations over and over until they are successful. The ones doing the ATO crimes may not even be the ones that stole the passwords in the first place. Often, very large lists of them can be found on the dark web. They use a brute-force type of attack called “credential-stuffing” to perform tests en masse using the stolen information. So always use unique login credentials for online sites. It doesn’t matter what the site is for. It can be a financial site, a gaming site, or even just a blogger’s site where no sensitive information may be held. They should each have unique passwords so that a thief isn’t successful when they are performing these password reuse attacks. Change them on a regular basis. Don’t leave them the same for years on end. That's just asking for trouble. Skimming is common and very effective. A device is placed in or around the slot where a payment card is inserted in an ATM machine, gas pump or any other place card are accepted. As the card is inserted, the device captures the sensitive data stored on it. A small camera can also be deployed to film the PIN being entered. The scammers can then use the information to create counterfeit payment cards or use it for card not present (CNP) fraud. Before inserting your card, look to see if there is any odd-looking device attached to the machine or if it looks substantially different from the last time you used it. If you have doubts, go to a different machine and contact the financial institution so someone can check it out. Sometimes all you really want are some statistics. 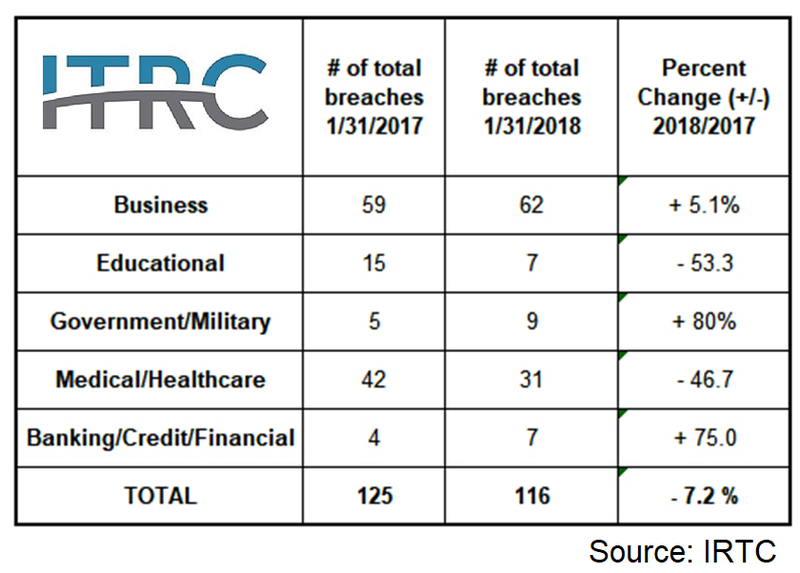 The Internet Threat Resource Center (ITRC) has put together a list of significant numbers for the first month of 2018 with regard to data breaches. They include some surprising bits and some that well, we just already expect. Let’s get to it, shall we? Overall there is some good news. This time last year IRTC recorded 125 breaches which is a few more than reported for the first month of 2018. In 2017, it was 125 and for 2018, down seven percent to 116. 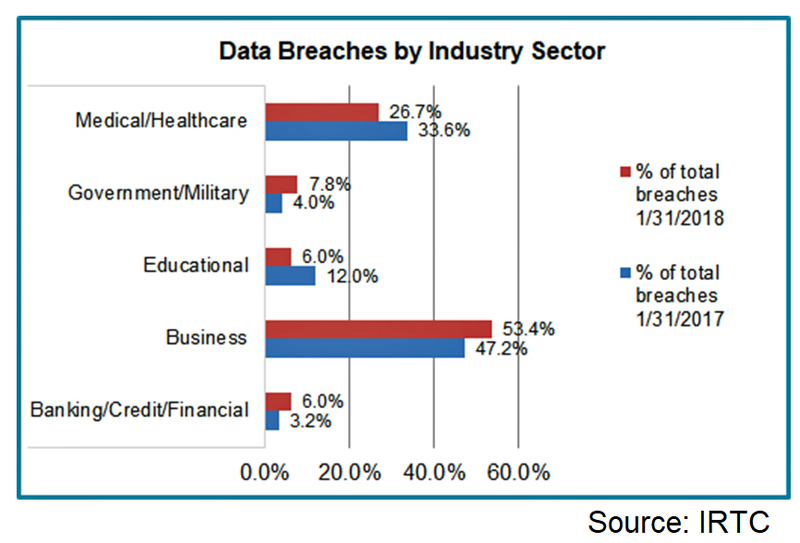 More than half of the recorded data breaches are considered “businesses,” which means they are retail services, transportation, utilities, payment processors, hospitality and tourism services, professional organizations, trade organizations, or others not included in education, medical/healthcare, government/military, or banking/credit/financial. Government and military breaches rose from 4% to 7.8% in January. Business increased to 53.4%, from 47.2% last year and unfortunately, banking, credit, and the financial industry saw an increase too. The good news is that the banking, credit, and financial industry is still at the bottom of the list compared to the other areas. This means that training on cybersecurity and other measures are working to protect important data. Unfortunately, the threat of hacking isn’t going away. 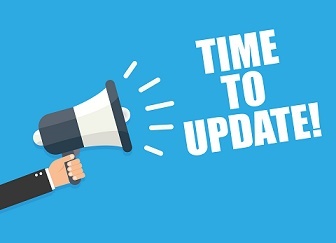 The report found that these (described by ITRC to include ransomware, phishing of all types, and skimming) continue to be the most common type of attacks, hitting nearly 30% of the total number of data breaches tracked. More than 10% involved ransomware or malware and 8.6% were phishing. Business: 63 breaches, 2,024,319 records accessed. Medical/Healthcare: 31 breaches, 232,589 records accessed. Government/Military: 9 breaches, 499,791 records accessed. Education: 7 breaches, 282,463 records accessed. Banking/Financial/Credit: 7 breaches, 119,279 records accessed. Continuing education and awareness training seems to be the key to keeping data safe. As records in the medical/healthcare industry continue to transition from paper to electronic, it will be increasingly important to perform continual training in those areas as well. If this does occur, it’s likely the numbers in those areas will go the way of the financial sector too. It seems the business sector may benefit from the same procedures as well. ATMs may seem like they're going the way of dinosaurs these days as we use less and less cash for payments and embrace cybercurrencies and electronic payment services such as PayPal and Venmo. However, the Secret Service recently issued a warning to financial institutions about the cyberattack called jackpotting, which involves that old T-Rex machine. This type of crime occurs when malicious software or hardware of some type, such as a card scanner, is used on the ATMs that cause them to issue large amounts of cash whenever the thief demands. According to the Secret Service, the criminals found vulnerabilities in machines that are in big-box retailers, stand alone, or that are of the drive-through variety. On top of this, the Secret Service claims to know of planned attempts to commit jackpotting in the U.S. and is advising financial institutions to be on alert. The average consumer need not worry because the funds are removed from the ATM and not attached to an account. The biggest concern is that an ATM won’t have any cash in it perhaps when said customer needs it. Thus far there have not been any reports of individuals being victims of this, but a Secret Service memo dated in January claims that at least six attacks already have been discovered in essentially all areas of the country. To thwart these attacks, which have paid the criminals an estimated $1 million according to CNN, the ATM owners should ensure their machines are upgraded. Many are still running on Microsoft Windows XP, which make them particularly vulnerable since that operating system is no longer supported. Increasing physical security around the machines is also a recommendation, particularly on the stand-alone machines. This is because the thieves must physically access them to commit a jackpotting attack. Shockingly, the first instance of jackpotting happened in 2010 and was not performed by a cybercriminal. It was done by the infamous New Zealander and “white hat” hacker, Barnaby Jack to raise awareness about jackpotting. While stealing via payment card and identity theft is still popular, visits to ATMs are starting to be a preferred method of stealing cold hard cash by gangs of cyberthieves. Called jackpotting or cashing out, recent attacks were carried out in Taiwan, Russia, the UK, The Netherlands, Spain, Belarus, Estonia, Armenia, and other countries throughout Europe and Asia, according to Europol and Trend Micro. 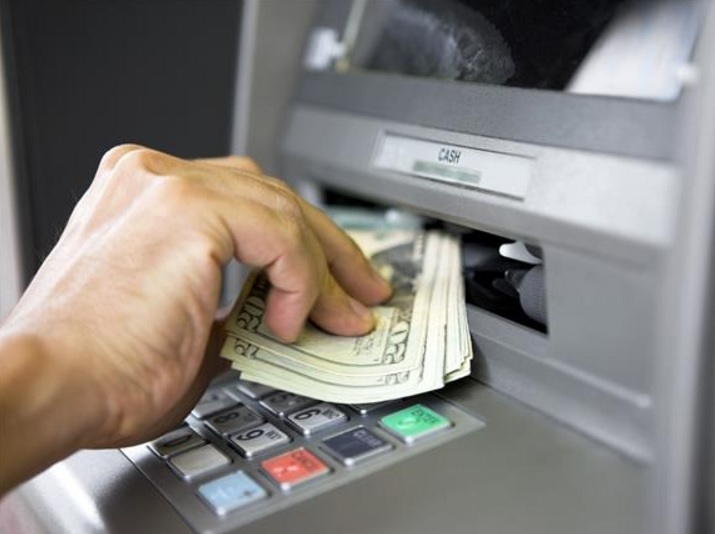 These groups use malware that is installed on a financial institution’s network, eventually making it to the ATMs allowing them to empty the machines of cash. Unsurprisingly, the malware gets there via spear-phishing. Typically, the thieves send a malicious attachment to prescreened employees of the financial institution. If it’s opened, the malware executes and makes its way through the network. This method allows it to bypass perimeter security tools such as firewalls and intrusion detection systems. 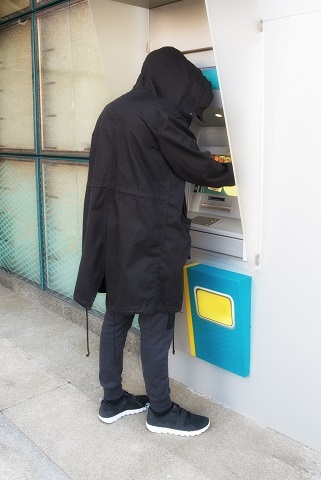 Once the malware is on the ATMs, a low-level group member (a money mule) enters a sequence of numbers onto the keypad and relieves the machine of all the cash inside. Sometimes debit and credit card information is also retrieved from the ATMs. Ripper malware was used in such an attack in Thailand in 2016. Thieves stole roughly $363,000 worth of baht. In Taiwan, a more sophisticated technique was used, where the thieves stole administrator credentials by accessing a bank’s voice recording system. They then mapped the network, locating the ATMs updating system, ultimately “updating” the system and loading malware that instructed the machines to dispense the maximum number of banknotes. They ended up with $2.7 million. These types of attacks are becoming more popular because it’s less risky than walking into a bank with a note and a firearm demanding all the cash from the drawers or vaults. In fact, it’s unlikely the criminals in a remote attack using the money mules will ever be identified or caught.